Canes are available in adjustable aluminum, quad cane and solid wood. Walkers by INVACARE are available as single release and dual release with either three or five-inch wheels. Rollators by MEDLINE are available in standard and lightweights and by NOVA in heavy-duty and mini-heavy-duty. Power Scooters by INVACARE are available in three and four-wheeled light and heavy-duty models. GOLDEN three and four-wheeled scooters are also available. 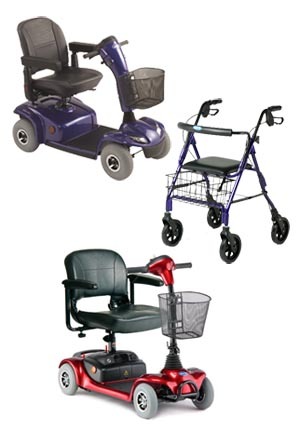 Power Wheelchairs by INVACARE are available in M41, M51, TDX Si2 and TDX HD models. PRIDE jazzy golden power wheelchairs are also available.